Lane Hill is a minor summit in the Santa Cruz Mtns of San Mateo County. It lies on private property along a ridge separating Pescadero and Pomponio Creeks. Maps and satellite views show the Pomponio Truck Trail running along the ridge for about three miles. I had attempted this one three years earlier out of Memorial County Park where the Pomponio Trail inside the park runs very close to the private road just outside the park's northern edge. On that outing, I had found a great deal of poison oak on the overgrown connector between the trail and road and in the end I balked and retreated. In the interim, I came to find that Andrew Kirmse and David Sanger had visited the summit by the very route I had turned back on. This just wouldn't do. Despite my high sensitivity to poison oak, I have a tough time handing the bushwhack title to someone else so easily. I would give it another try. Finding I still had more time and energy when I finished, I paid a visit to Peak 700ft on the other side of Pescadero Creek, a few miles downstream. The hike isn't long, but it's all cross-country through some rough county. Andrew and David had climbed this one last year as well, reporting on PB "Only a crazed peakbagger would be found wandering in these woods. Not for the faint-hearted." Definitely up my alley. Mt. Ellen is an exceedingly minor summit within Memorial Park that I had visited on that first effort. I had to take that TR down from my website since it was paired with another summit whose owner asked that I do so. Goat Hill is on the way to Lane Hill, a freebie with very little prominence. In order to minimize my chances of running into a rancher, I figured I should start at first light which comes pretty early this time of year. With an hour of driving to reach the TH from home, I found myself getting up at 4a - haven't done that in quite a long time. The campground at Memorial Park was filled with campers for the long 4th of July holiday, though none of them were awake when I pulled up around 5:30a. To avoid the $6 fee for day users, I parked on the other side of the bridge on Wurr Rd, upstream from the park. All the potential parking places closer along Pescadero Creek Rd are marked for No Parking. I walked down the main road to find the Mt. Ellen Trailhead and started up. It took but 15min to make my way to Mt. Ellen. For the 3rd day in a row, the landscape was steeped in a heavy fog and would curtail views all morning. Another 15min got me to the edge of the park. I happened to look up and notice the road cut above me, not 10yds away with a very easy crossing and a minimum of poison oak. Nice! From this point it's roughly 3mi to Lane Hill. The first and last mile have maintained roads but the middle mile is the meat of the problem, I came to find. 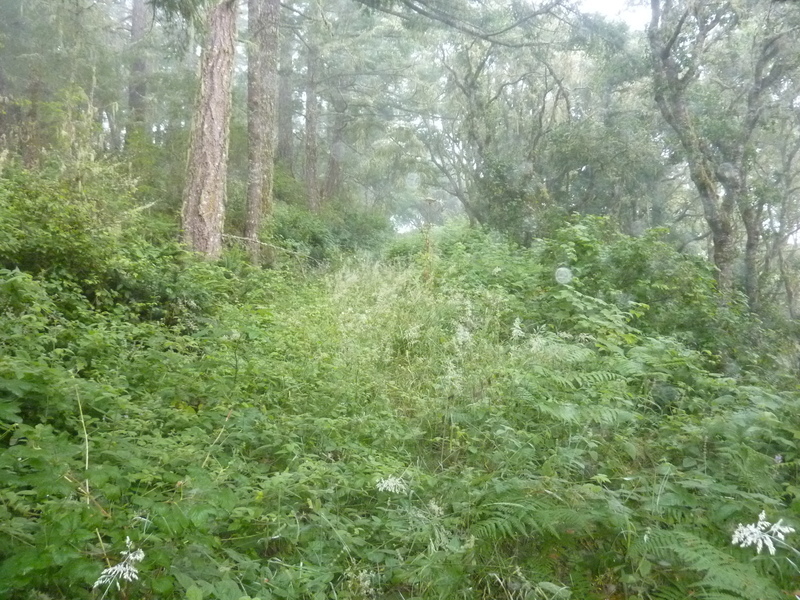 Here the roadbed is filled with waist-high plants of all types with a fair representation of poison oak. My boots and pants got completely soaked in no time, picking up all the dew and fog that had settled on the vegetation overnight. In one section the road is heavily overgrown on the sides and from above, leaving me to do some tunneling to get through it. Shortly after this I crossed a property boundary and followed a set of ATV tracks through another rough stretch before emerging atop Goat Hill around 7a. The top is flattened with a concrete foundation that might be the top of a buried reservoir. Nearby is a small solar instrument installation that looks to be no longer maintained. The fog continued to cover the hills as I walked through an active ranch area for the last mile. I could hear cattle lowing somewhere downslope through the fog on my left and found lots of fresh patties along the road I traveled. I was surprised to find a couple of empty truck trailers parked off the road in the tall grass. How they got there is a bit of a mystery considering the poor condition of the road. I crossed a last fenceline just before reaching Lane Hill, whose summit is occupied by a green water tank. With more fog to look on, there was no reason to hang out at the summit and I turned tail to start back almost as soon as I had arrived. I was happy to find no cattle, no trucks, no ATVs, no people for the hours I was hiking the truck trail. After returning to Memorial Park and down the Mt. Ellen Trail, I wandered through the main part of the park on the east side of the road where there are dozens of old redwoods populating the area around Pescadero Creek. Campers were awake with fires and breakfast, the mosquitoes awakened as well and on the prowl It was almost 9a when I returned to the bridge and my car.